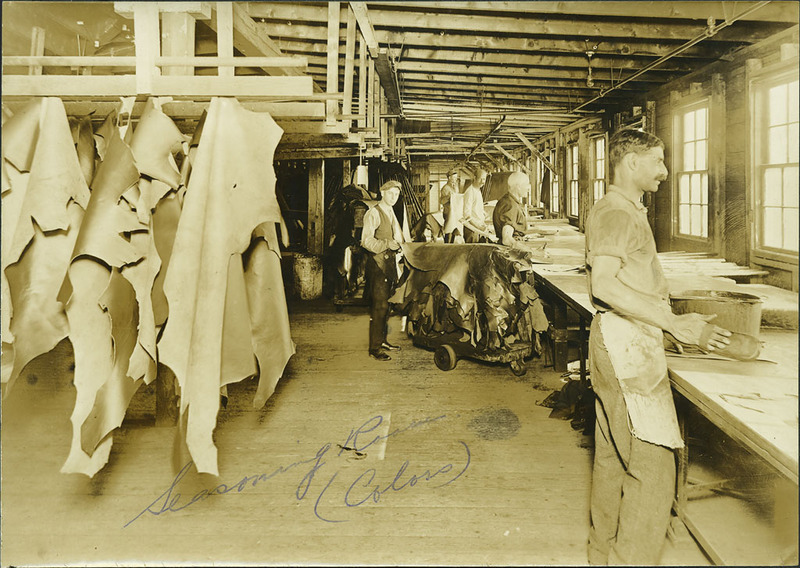 Black and white photograph with ball point pen noting Seasoning Room (Colors) at the Boston Mat Leather Company, Peabody, Massachusetts, 1918. Five men are in the photograph. Four stand at a long table as they work. The closest to the camera has something gripped in his hand. In the center of the photo is another young man before a wagon of leather hides, lifting one up. Behind them are hides hanging from wooden racks. “Seasoning room (colors),” Peabody Institute Library, Peabody, Mass., accessed April 18, 2019, https://digitalheritage.noblenet.org/peabody/items/show/177.